Glen Reynolds pushed for the wall to be salvaged. Proposals to demolish an 800-year-old wall in Banff have been thrown out by councillors. 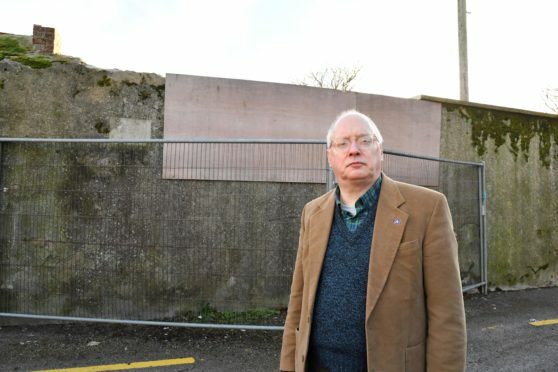 Applicant Peter Innes lodged the plans to knock down the B-listed structure on Carmelite Street to create parking for his town house property so it could be used as a holiday let. Currently Mr Innes is unable to park at the property without issues arising with the neighbouring Post Office. The applicant has the legal right to drive through the depot car park and believed removing the wall would solve this issue and create parking on his own land. The Banff and Buchan area committee members went against council planning officer recommendations and refused the application on conservation grounds and road safety concerns. Work to demolish the wall was immediately halted when the applicant was made aware of its age and listing to allow for the planning process. Five objections were then entered against the part-retrospective demolition application. After a lengthy discussion about the merits of the proposals, Banff councillor Glen Reynolds put forward a motion. He said: “My motion is to refuse this on the basis that I believe there are associated issues with traffic safety as set out in one of the objection letters which I don’t think have been addressed. The motion was left unopposed, with unanimous support for the rejection. Mr Innes said he was “most disappointed” at the decision and claimed it satisfied the council and Historic Scotland’s planning conditions. He also speculated that their decision had been politically-motivated. “I ask if they’ve even seen it and I suspect not,” he said. “Personally I can’t see how anyone would think the wall was worth keeping and it’s not proven to be 800 years-old – half of it is red brick and harling.